From eminent biologists like Alfred Russel Wallace and Charles Darwin to famous authors such as Rudyard Kipling in his Just So Stories, many people have asked, “Why do zebras have stripes?” There are many explanations, but until now hardly any have been seriously addressed or even tested. In Zebra Stripes, Tim Caro takes readers through a decade of painstaking fieldwork examining the significance of black-and-white striping and, after systematically dismissing every hypothesis for these markings with new data, he arrives at a surprising conclusion: zebra markings are nature’s defense against biting fly annoyance. Popular explanations for stripes range from camouflage to confusion of predators, social facilitation, and even temperature regulation. It is a serious challenge to test these proposals on large animals living in the wild, but using a combination of careful observations, simple field experiments, comparative information, and logic, Caro is able to weigh up the pros and cons of each idea. Eventually—driven by experiments showing that biting flies avoid landing on striped surfaces, observations that striping is most intense where biting flies are abundant, and knowledge of zebras’ susceptibility to biting flies and vulnerability to the diseases that flies carry—Caro concludes that black-and-white stripes are an adaptation to thwart biting fly attack. 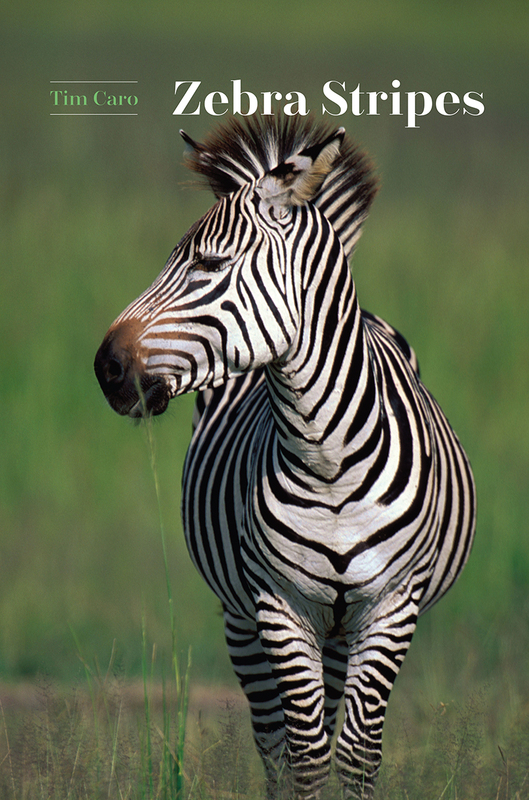 Not just a tale of one scientist’s quest to solve a classic mystery of biology, Zebra Stripes is also a testament to the tremendous value of longitudinal research in behavioral ecology, demonstrating how observation, experiment, and comparative research can together reshape our understanding of the natural world. "The purpose of zebra stripes has perplexed science at least since Charles Darwin debated the matter with fellow Victorian naturalist Alfred Russel Wallace. Today, according to Caro, no fewer than four groups of researchers study the question. They do not lack for hypotheses: In Caro’s new book, Zebra Stripes, he outlines nearly twenty of them. . . . He decided to test each of these ideas one by one, in the field, over a decade of summers. This was the scientific method on repeat: Trial and error after trial and error. And because studying large wild mammals is no easy task, Caro had to get creative. Coming up with experiments was, he said, 'the thing that taxed me most.' . . . Caro’s [is a] systematic, sometimes wacky quest, which he refers to as a 'personal discovery.'" "In an era of big data, it might be considered quaint to spend over a decade studying a Victorian question, one that has been debated by Wallace, Darwin, and a cast of others: namely, the function of stripes on animals. And, indeed, why zebras, uniquely among equids (horses, zebras, and wild asses), have stripes. However, Caro’s book Zebra Stripes is a testament to the power of comprehensive scholarship, logic, creativity, self-criticism, persistence, and passion, and shows that outstanding science can be done with limited support." Martin Stevens, University of Exeter, author of "Cheats and Deceits: How Animals and Plants Exploit and Mislead"